The commentator on the telly said, “Ye naujawan kaafi dinon se bhartiye cricket team ke darwaaze pe dastak de raha tha. Aaj aakhirkaar inko mauqa mil hi gaya.” [This young man has been knocking on the Indian team’s door for quite some time. Finally, he has got the opportunity!] It was December 31, 1984. The English side was touring India. The young man was a tall, lanky, and shy 21 years old working as a clerk at SBI in Hyderabad. The Englishmen had never heard of him. And so did I! The young batsman showed tremendous concentration and skills. The experts were reminded of the wristy Gundappa Viswanath! He went on to score a hundred in his very first match. A remarkable achievement by any standard. More was to follow. By the time the second test started the Englishmen knew he was the danger man. So much that Mike Gatting later said, “Whenever that black thing (referring to his tawiz or the amulet) hung out we knew we were in trouble.” Even the gods favoured the wristy genius on the ground. He scored a hundred again! This time the whole of India and the cricketing world noticed. Mohd Azharuddin had arrived! When Azhar scored the third consecutive test hundred in his debut series, India had found a new hero. For a nation still recovering from the assassination of its much loved PM Mrs Gandhi, it was time to rejoice. For Azhar, it was a mixed feeling, his grandfather, Vajehuddin, who raised him died days before he could score his first century for the country. Azhar was now a star that media loved. His life was all out there. A practising Muslim who never misses his prayers (used to carry his prayer mat wherever he went), sharing sayings of the Holy Qurán with his fellow players, humble to the core, a person you would love to have as a friend, Azharuddin had everything you could ask for. The icing on the cake was his promotion to the post of Branch Manager by the bank, as a reward for his tremendous achievement. If Kapil Dev introduced me to the exciting world of Cricket, Azhar made me passionate about it. It would be wrong not to admit that I was a bit partial to him. He was the Muslim I wanted to emulate. And so did many others I knew. His early marriage to the lovely Naureen, and the start of a happy married life, once again highlighted his commitment to whatever he did. Azhar was never involved in any controversy, be it cricket or his personal life. No link ups, nothing! On the cricket pitch, if in his opinion he was out, he walked off the field even before the umpire raised his finger. Not even a bad umpiring decision ever resulted in any show of disappointment from him. He never had anything bad to say about others. In a TV programme some time back, one of his friends mentioned about Azhar’s acts of charity. Every time he came to the ground in Hyderabad for practice with the team, he would tell the most promising cricketer to pick any equipment from his kit. 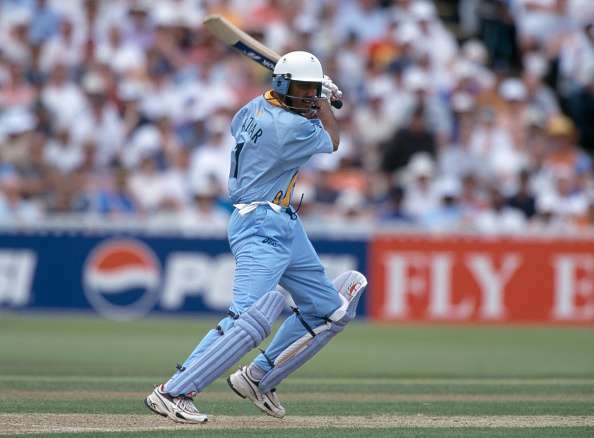 Azharuddin personified the ‘gentlemen’ of cricket. The crowning glory came in 1990 when he was appointed the captain of the Indian cricket team. The selectors thought he had the right image and the ability to lead the team during a difficult period. In the early nineties when Azhar topped the India Today poll of the popular Indians you look up to as idols, leaving people like Rajiv Gandhi to a distant second spot, it was the pinnacle of his popularity. Sadly, this was also the time when the earthly Azhar shifted his focus beyond the cricketing field. The man who earned a paltry Rs 800 in 1981 was reaping millions through his exploits on the ground. He did an ad shoot with Sangeeta Bijlani and things changed! From reading cricket and health-related magazines only, he showed a new interest in film glossies. Azhar started frequenting Bombay too. For somebody who went to bed early, he was spotted at parties which went late into the night. The last nail in the coffin was his divorcing Naureen to marry Sangeeta Bijlani. The same Azhar who could play the English half asleep faltered against them in the subsequent England tour, amidst all these personal upheavals. His faith too was shaken – the man who was so particular about his prayers started missing even his Friday prayers. He became arrogant towards the press and greedy. The attitude was reflected in his approach towards the game. His displeasure at given out in a one day game at Bombay (I think it was the Hero Cup) created a mini-riot in the stadium. His weird ways of getting out shook even die-hard fans like me. The 74 balls hundred at his favourite Eden Gardens was full of anger, Azhar did not even acknowledge the standing ovation the crowd gave him. Surely this was not the Azhar people knew. When the match-fixing scandal broke out, the volcano finally erupted. BCCI banned him for life, media massacred his image, Income Tax guys went after him, his fans got disillusioned, and his close friends parted ways. Azhar said once, “Trials and tribulations are God’s way of testing our faith.” But, this was a far difficult test. Azhar became a recluse. The clock turned back to 1981. He became a nobody! Can Azhar bounce back for one last time, as he always did during his playing days? Can he prove his innocence? Perhaps it is too late! The damage has been done. The magical figure of 100 tests will always elude him. For me, the end of Azhar’s era put a stop to my passion for cricket. I was shattered and appalled, like million others who prayed for his return every time he was dropped. Whatever may be the circumstances, his name figured in the controversy. He was perhaps singled out, but not because he was a Muslim as he claimed. The life of Mohd Azharuddin is nothing short of a Greek tragedy. It would be fair to remember him as a genius with the bat and a fielder par excellence.